Thanks to Olmanriver for this one ! In the year 1844 William Kirkham, now deceased, married in Kentucky & getting the California fever, like many others in “49 & ’50, left his old home & came to this state, & located on Wilson creek. He left behind him a wife & two children, the eldest of which is now 24 years of age. .
Kirkham lived the life of a bachelor here until four or five years ago, when he took unto himself another wife (a dusky maiden), by whom he became the father of two more children. Wife number 1 hearing of this, came from her old home in ~ Kentucky for the purpose of commencing an action against her truant husband for bigamy, & arrived about one year ago, living at Arcata since the time of her arrival. But the second marriage being not properly solemnized, being performed by Lieutenant Halloran, then an officer in the U. S. Army, at Camp Gaston, the proceedings against the much married husband were not commenced. Wife number 1 finding that the law would not sustain her in proceedings for bigamy, was about to commence an action for divorce when Kirkham died, & left surviving, a wife at Arcata, number 1, & two children, the issue of said marriage, & a wife, number 2, at Willow creek, & two children, & an estate of the value of about $4,000, which was willed to wife number 2, & A. Norton, of Mad River, was named as the executor of said estate. Yesterday a friend and I made the trip to Ferndale to take a tour through Fern Cottage. 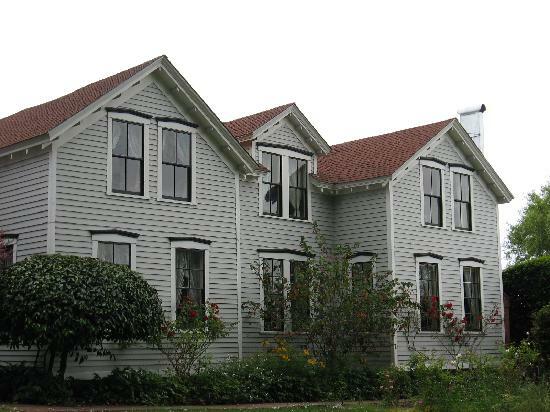 “Fern Cottage is the 30-room home of pioneers Joseph and Zipporah Russ, built for their growing family in 1866. Architect/Builder George Fairfield designed Fern Cottage for the cattle-ranching family and it was added to the National Register of Historic Places in 1988. Nearly all of the furniture and furnishings in Fern Cottage are original, so visitors will see it much as it was in the 1870s when the family lived there. Located three miles west of Ferndale, Fern Cottage sits on 1,600 acres, surrounded by pastoral fields. Of course, the video doesn’t address rumors that early in the settlement period, Joseph Russ kept an Indian girl as a mistress and had a child by her. The narrator doesn’t talk about Russ’s missing ear–and tell me whether it was damaged because a bull bit it, or because, when Joseph Russ grew tired of his Native concubine and tried to drive her and their child away, she attacked him and bit part of his ear off. You are currently browsing the archives for the Squawmen category.